Most anglers think about this question but few actually talk about it. The differences between the Pacific snook, which are inclusive of the Gulf of Mexico variety, and the Atlantic snook are not that great. They both look about the same with almost identical characteristics. They both have the tell-tale signs that indicate that they should be handled with extreme caution stemming from switchblade-like gill plate covers and an aggressive feeding pattern. They are also alike in the voracity of their strikes and the difficulty in catching each variety. Yet there still exists some subtle differences and not-as subtle as to only be decipherable by heavily-educated and really smart marine biologist types from the University of South Florida! This will not be a scientific breakdown of the differences between a Gulf of Mexico (Pacific) snook that are found on Southwest Florida’s coastal waterways, and the Atlantic variety snook. This will be more of a brief overview of the differences so that if you happen to catch a strange looking snook while snookin at Gordon’s Pass you will know that possibly you have caught a wayward Atlantic snook that crossed over through the states man-made passages. Contrary to popular belief there is a slight variation in the species of what is known as the common snook. Back in the day these commoners were thought to be the same strain of fish. Through scientific research we now understand that although they are both from the same family there is a very slight, definitely-minute difference in both sides of the state’s snook populations. The Gulf of Mexico snook is a bit smaller and lives a shorter time frame than the larger and more populous Atlantic common snook. Does this matter at all when it comes to hooking into either a 12 pound Pacific snook in the 10,000 Islands or a 15 pound Atlantic snook under a dock in Boca Raton on a moonlit night? Of course it doesn’t as both are wonderful and these fish will both readily test the metal and the magnitude of your fishing experience as well as every ounce of your fishing gear. We just thought that you would like a little review on the differences that are found between Pacific and Atlantic snook. 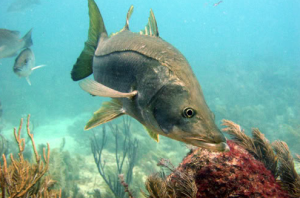 Before we close this review on the differences between Atlantic and Pacific common snook, we should pay a little homage to the other side of the street and the Atlantic snook. The largest common snook on record and the record that counts regardless of what side of the fence you are on either Atlantic or Pacific was caught off Costa Rica in 1973 at 53 lbs. 10 ounces. While this is the current all-tackle record, there are reports of even larger common snook in Florida waters, though none have been recognized by the IGFA.